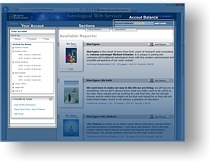 Matrix Web Services has three primary sections Your Account, Your Balance, and The Sections. YOUR ACCOUNT â€” In this section you will find all your personal data, list of all charts you entered, history all the services you order and your Personal Profile. ACCOUNT BALANCE â€” Shows you how much money or days you have left on your account and a Add Funds button to easy add money or renew you subscription. NOTE: The Buy as you need account will show you the balance in $0. 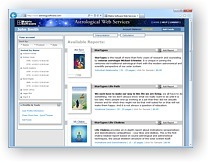 SECTIONS â€” Matrix Web Services has two primary sections Interpretations and Calculations. Clicking on the tab will show you all the services available for this section. SORT DATA MENU â€” You can sort your saved charts by customer Name, Products ordered, and Data of the Purchase just clicking on the menu. 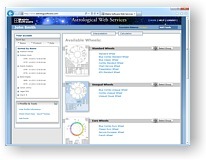 CHART DATA & HISTORY AREA â€” This area will display all the charts that you have saved and will be displayed in the order you selected on the Sort Menu. You can click on any of the listed items to pop-up a detailed list of the item. This data will be saved for as long as your subscription is valid. You will be notified when your subscription is about to run out so that you don't lose any of your data. EDIT PROFILE â€” This is a collapsible menu that don't show up until you click on it, to close it, just click the minus icon. Here you can update you personal data like your e-mail, address, phone number, etc. as well as edit your customer personal contact information. Also you can delete old jobs that you don't need any more, display a complete list of your purchase history, etc..
Also on this area you can add funds to your account (you can also use the top-left link next to your account balance). AMOUNT OF YOUR CREDIT â€” Amount of credit left on your account will be shown on the top right corner of the page. If you have a 6/12 month subscription, it will show you the days left on your subscription. If you have a Pay-As-You-Go account, it will show the amount of dollars left in your account. If you have a Buy as you need or the Free Limited account, it will show the amount of dollars in $0.00. ADD FUNDS â€” To add funds to you account, just click on the Add Funds button next to the Account balance or on the link provided on the Edit Profile area. â€” Subscriptions: A 6 month subscription is only $50 and you get $30 credit for reports. A 1 Year subscription for $100 and you get $60 credit for reports. For as long as your subscription is valid, we will keep data to all your charts. You will be notified when your subscription is about to run out. Use any of our products as many times as you like for this flat yearly or bi-yearly fee. â€” Pay-As-You-Go: Add money anytime. Put as little as $25 dollars in for $30 worth of services. For $50 you get $60 worth of services. For $100 you get $125 worth of services. We keep your chart data as long as your balance is above $10. INTERPRETATION â€” Online reports. Online reports. 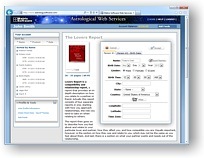 20 different reports from Natal to Forecasting including the Matrix' most popular reports like Friends & Lovers, Astro*Talk, TimeLine, The Light Series, etc.. Reports are delivered in PDF format, emailed by PDF directly to you or to your customer. Click on the name on each of the reports to see a full PDF sample. 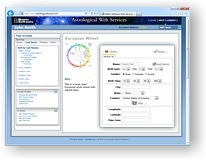 CALCULATION â€” Astrological Chart Wheels online. 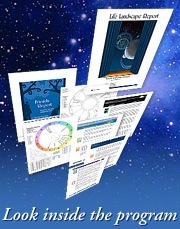 Hundred of charts to choose from -- the simplest Standard Wheel to the most elaborate designs. You can make your own Chart Wheels choosing from hundreds of different sizes, formats, and designs that we have available for you. Click on the name of each chart to see a PDF sample.